Since the dress has so much detail, I wanted the earrings to be simple and understated. 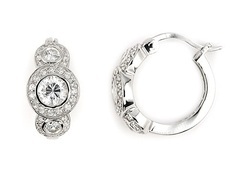 These hoops are perfect and have a classic, vintage look. I love the look of the veil coming out of the hair because then all of the work of the hair style isn't hidden. 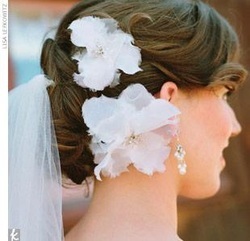 I will be doing something like this without the flowers. 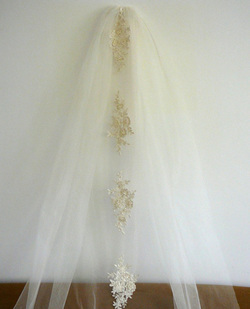 Here is my veil. It is fingertip length and I bought it from Romanticrona's shop on Etsy. I love it and the appliques match the ones on the skirt of my dress. The Dress!! Jasmine T384. The picture totally does not do it justice. 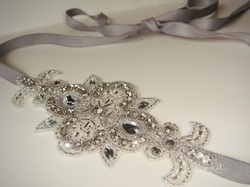 It is really sparkly in person and has a belted waist. It's poufy but not overwhelming and all of the tulle at the bottom is exactly what I was looking for. The shoes!! They are really comfortable and sparkly!!! Plus they were under $50 so I could not pass them up.